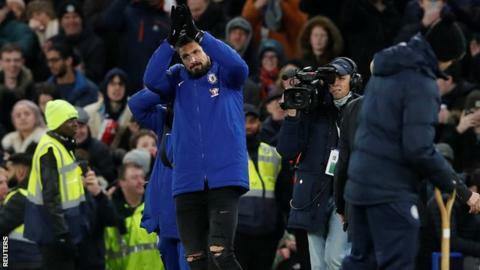 Olivier Giroud was "massively popular" at Arsenal but the club "opened the door" on a sale to Chelsea because the striker wanted regular football before the World Cup, says boss Arsene Wenger. Frenchman Giroud, 31, joined the Blues in an £18m deal on the closing day of the winter transfer window, the same day Arsenal completed the club record signing of Pierre-Emerick Aubameyang. He scored 105 goals in 253 games after signing from Montpellier in June 2012. "We owe him a lot," Wenger said. "It was linked with the Aubameyang deal and he has just had a third baby so it was difficult on the family side for him to leave London. It was difficult to turn down [Chelsea's offer] just because it is an opponent," he added. "He was massively popular in the dressing room and the club, for all the players that left it was sad to see them go, but Olivier wanted more playing time - he wants as well to go to the World Cup. That is why I opened the door." Wenger also said Gabon striker Aubameyang - who was signed from Borussia Dortmund for £56m - is a doubt for Saturday's Premier League fixture at home to Everton. The Frenchman said Aubameyang has been ill and that his fitness will be assessed before the 17:30 GMT kick-off. A great window but are Arsenal ‘at war’?